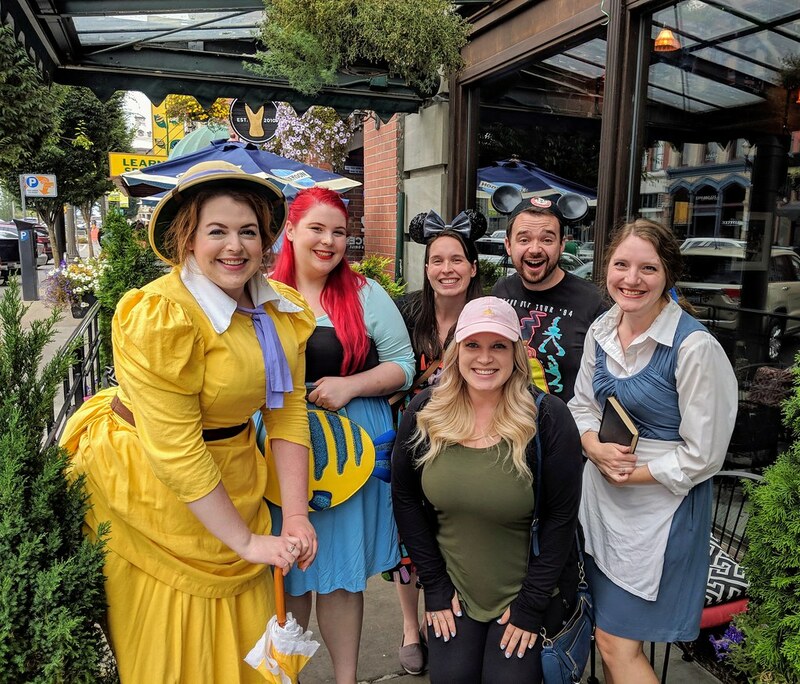 On Saturday, a group of my friends and I attended the Geeks Who Drink "When You Wish Upon a Bar" Disney quiz in Tacoma. 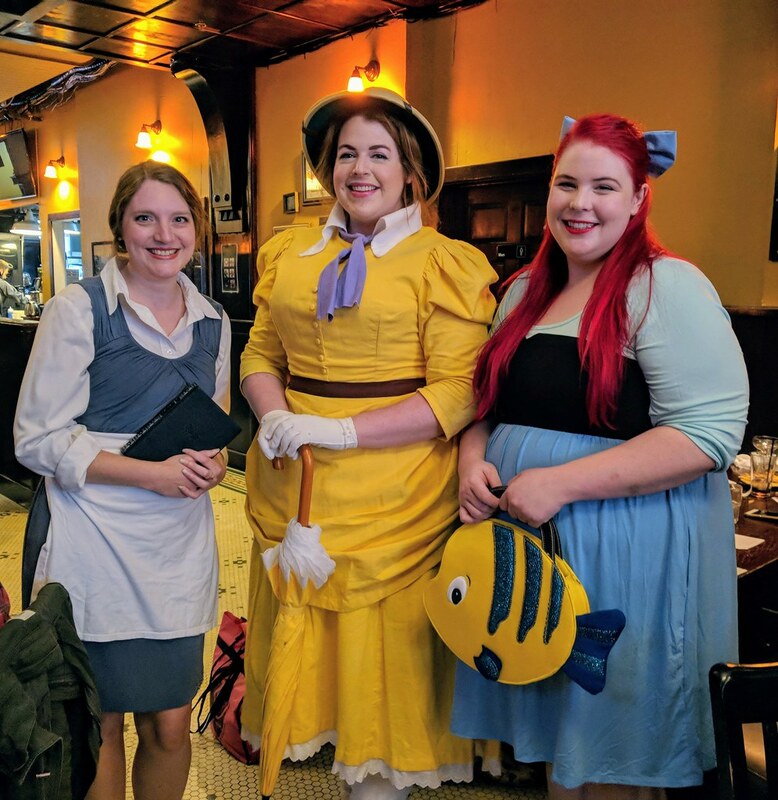 Three of us dressed up, and I pulled out Jane to wear. 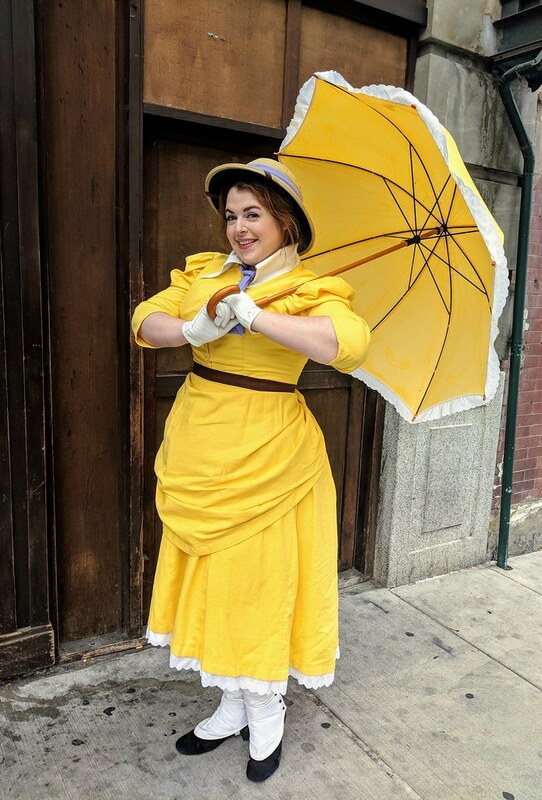 I haven't worn this costume in years (I think the last time was for Emerald City ComiCon in March 2014), and the funny thing about returning to old costumes is that all of a sudden all the problems seem to be much more obvious. 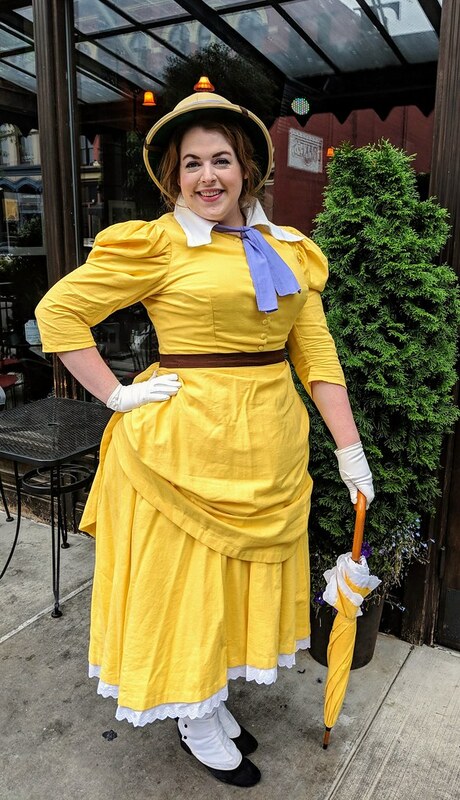 Like how stupidly large and ill-fitting that collar is, and the fact that once that hugely wide but very short bustle collapses, it doesn't want to un-collapse. Nevertheless, I still won the costume contest! And better yet, we won 1st place in the quiz, too! Anyway, here's a few pictures! 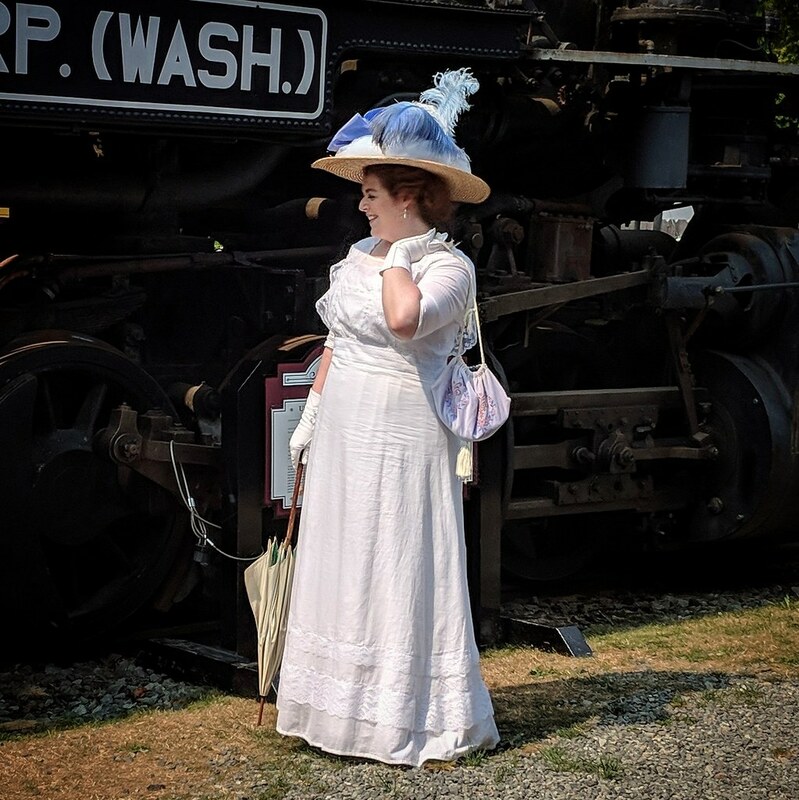 Saturday was the Snoqualmie Railroad Days event that I was making the new teens-era dress for. 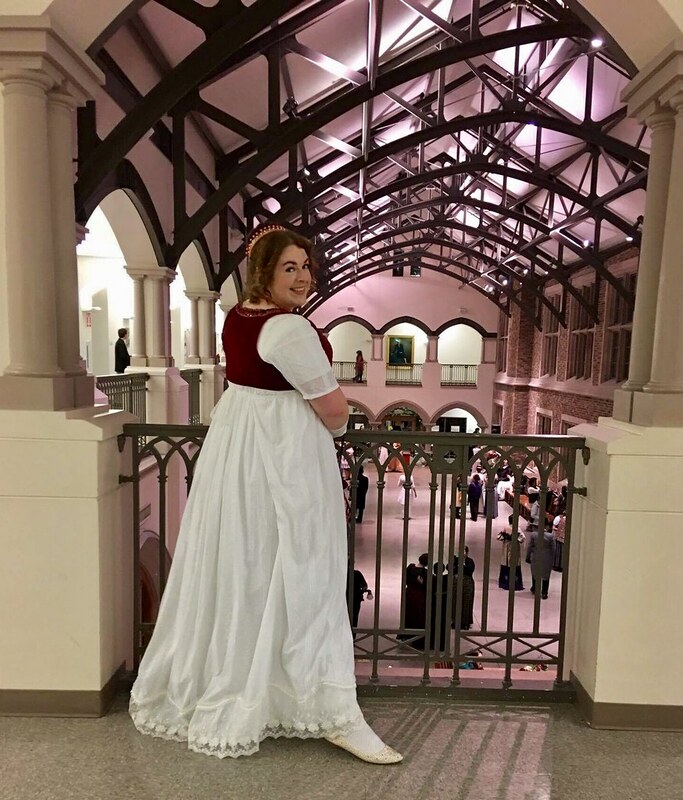 I did finish my dress, though I wound up staying up to 2am the night before in order to finish it! Luckily, I was aiming to be at the event at 11, and it was only 35 mins away, so I still got some sleep. When I arrived there, I wound up being pulled into the fashion show that some of my friends were participating in, because one of their teens-era models had cancelled. So I'm glad I wore the new dress! 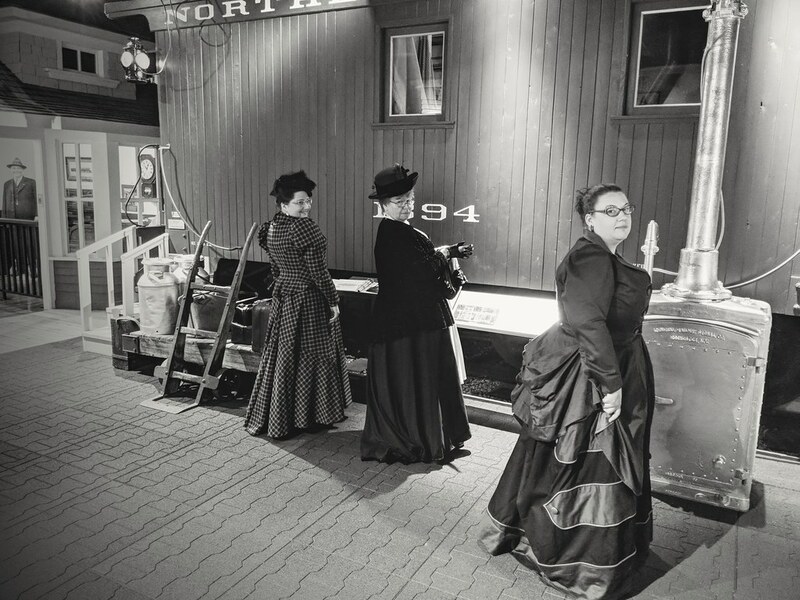 Because we participated in the show, the event organizers gave us free tickets for the train ride, and that was neat. 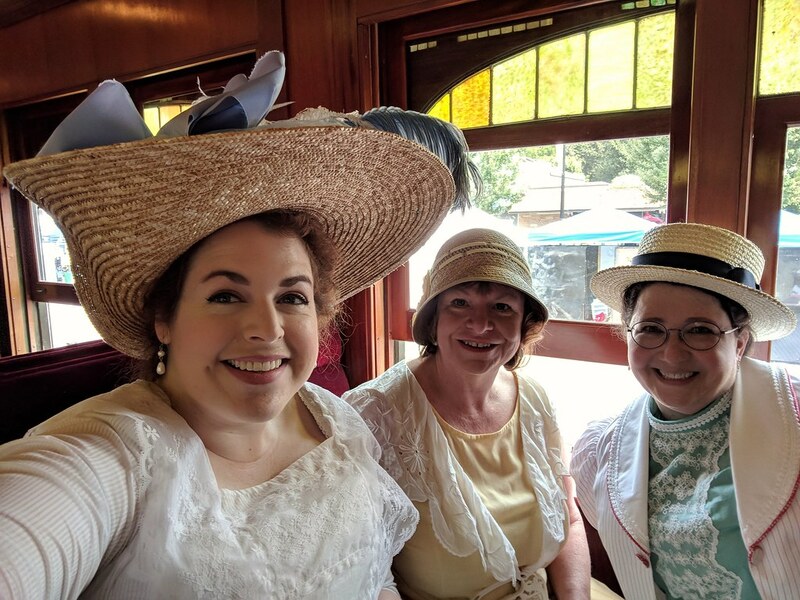 We got to ride in a restored car from 1912, which was very fitting, and it was lovely inside. The train ride also included a stop at their train shed, where you can look at other engines and cars that are being restored - I found the most interesting one to be a baptist church on rails, since I had never seen anything like that before. After the train ride, we had ice cream at an old ice cream parlour, and checked out a couple history booths. 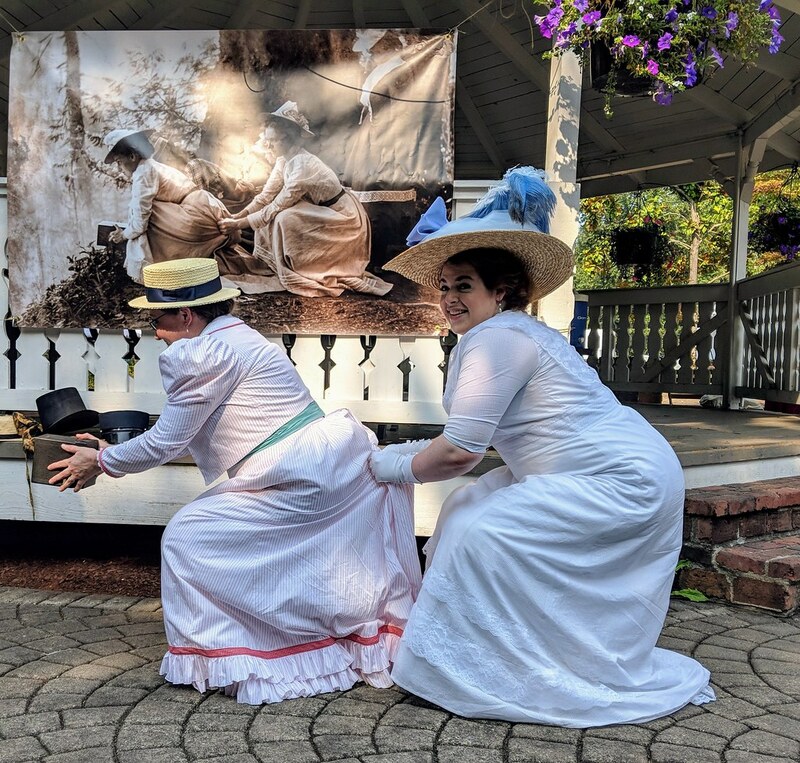 Then we attempted to head to the car, and got stopped by two different photographers asking if we could take a couple pictures with them - of course, the first one didn't tell us he was going to take 20 minutes! Hopefully they'll at least email me the pictures they took. 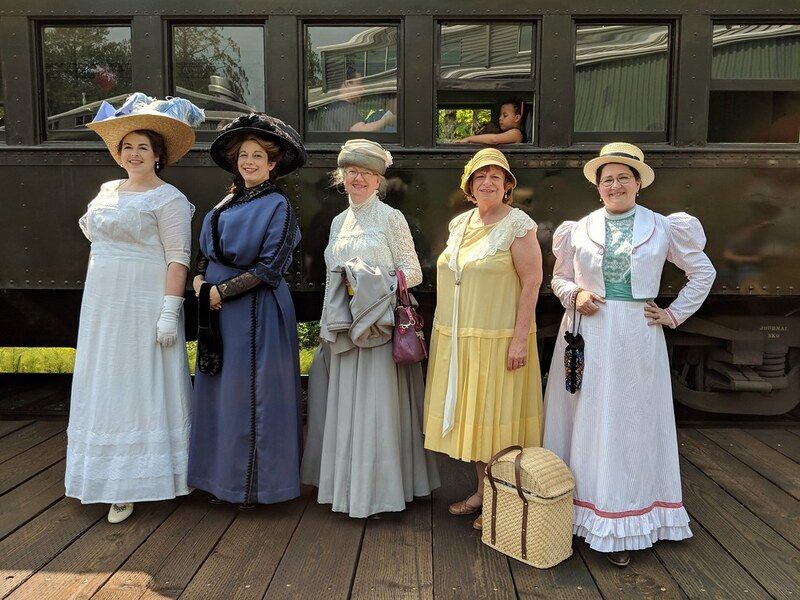 Anyway, it was mostly a town festival, and the only people dressed up were those of us in the fashion show, plus 2-3 people working the history booths, but at least riding the train in costume was fun. I've been wanting to do that for a while. 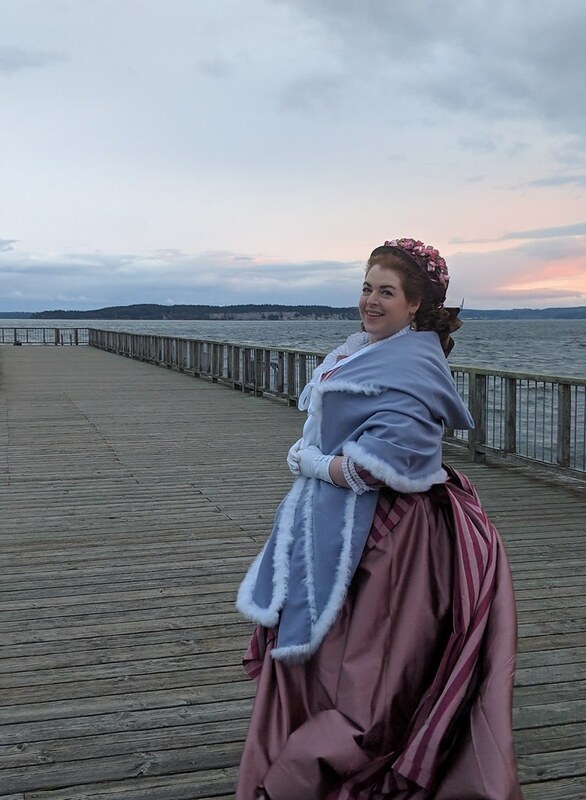 My dress turned out to be very comfortable, era-appropriate, and easy to wear, though I do wish I had had time to procure non-poly lace, since I don't love the look. 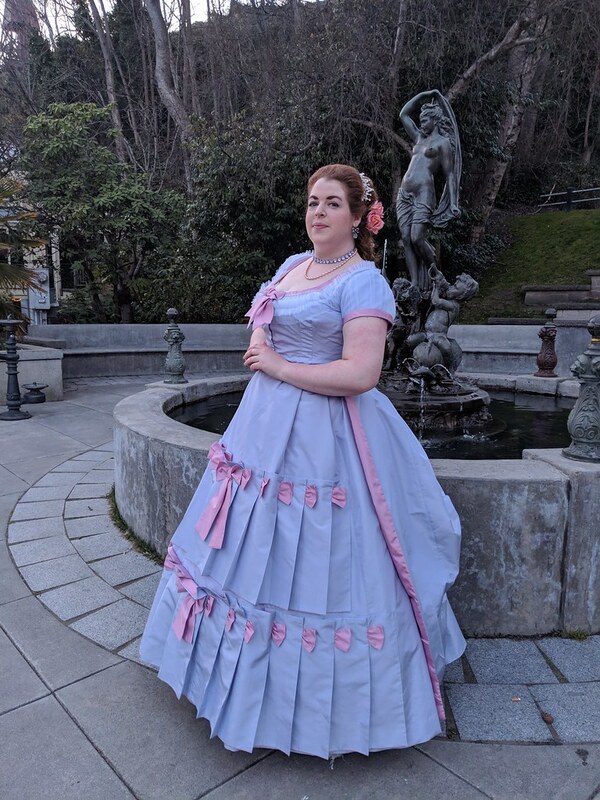 But after all the alterations I mentioned in my previous post, it was quite an easy dress to make, even though I added extra embellishments. Here's some pictures! The rest of them are on Facebook. 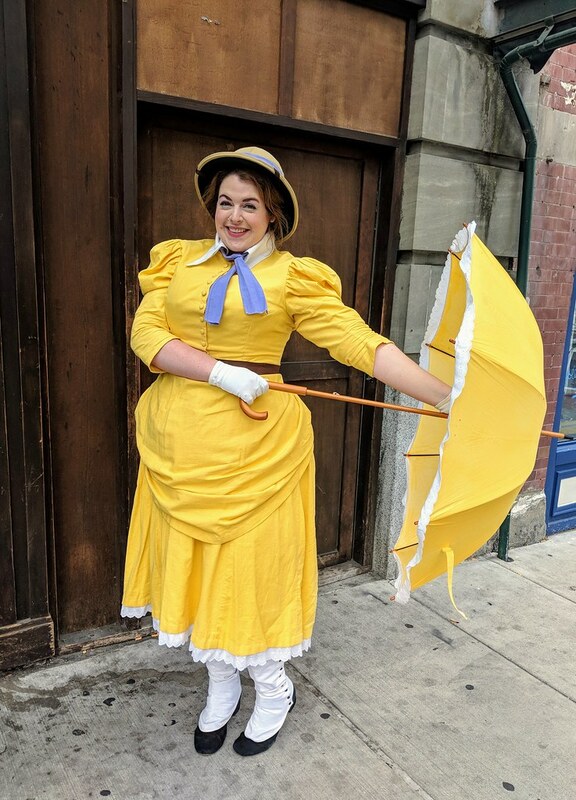 That was my last historical event this month, though next Saturday, I'll be participating in the Geeks Who Drink Disney quiz, and I plan to wear my Jane bustle outfit. I hope to start sewing tomorrow, but next up will be a present for someone, and doing lots of mending of costumes that I've been putting off for quite a while. Then probably a dapper dress out of the awesome villains fabric I found at Joanns, and then I should probably figure out what I'm making for Halloween. And or start new 18th c stays or put together the s-bend corset whose mockup I had forgotten that I already cut out! This month is apparently my costume event month, since every weekend has/will involve costumes. 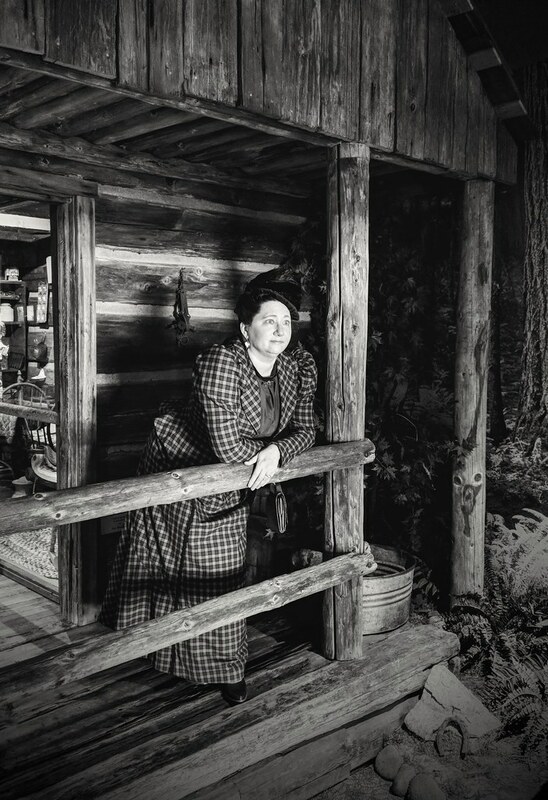 (CoCo, then the Ren Faire, then the NW Colonial Festival, plus next week is Snoqualmie Railroad Days, followed by a costume contest at Disney Trivia). 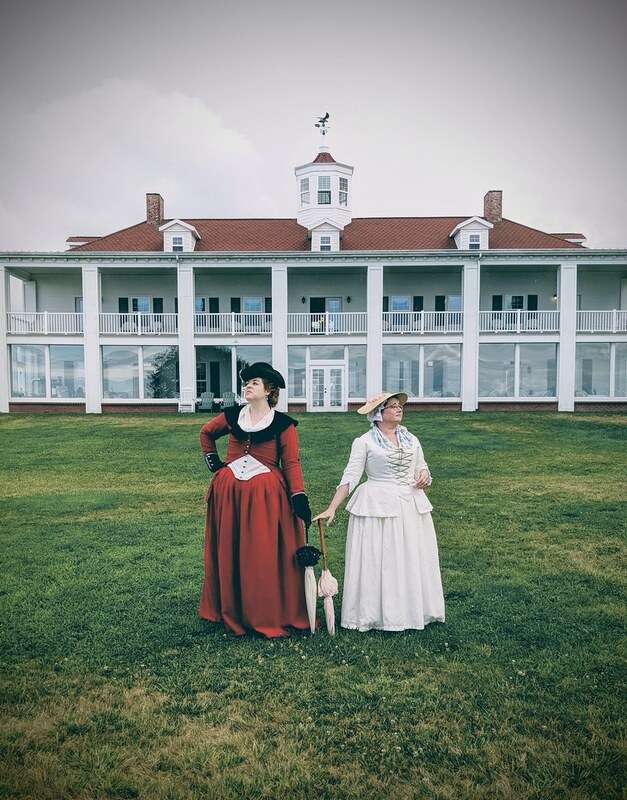 So anyway, on Saturday I went to the NW Colonial Festival. Despite the pouring rain that started right after we arrived, it was wonderful! (and the rain did mostly clear up). 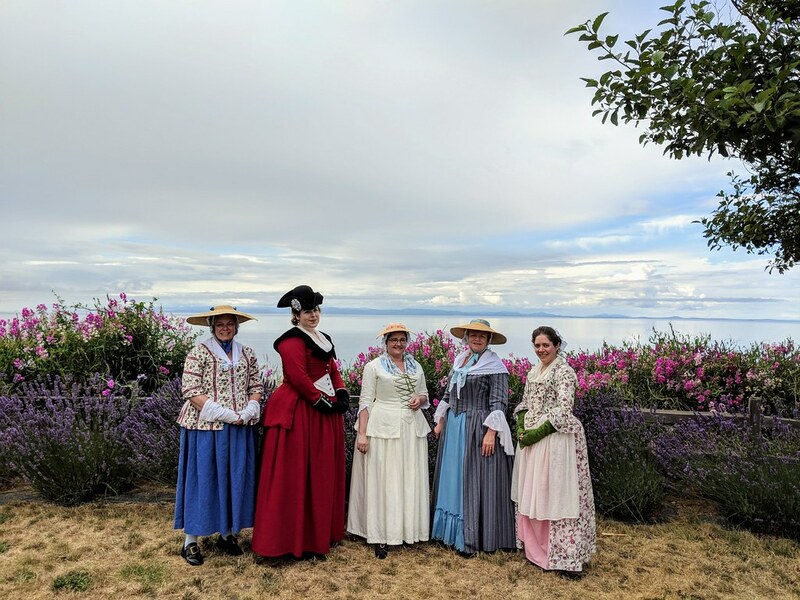 It's such a gorgeous location, on the grounds of an inn designed to look like Mount Vernon, with views of the Strait of Juan de Fuca on one side, and the Olympic mountains on the other. 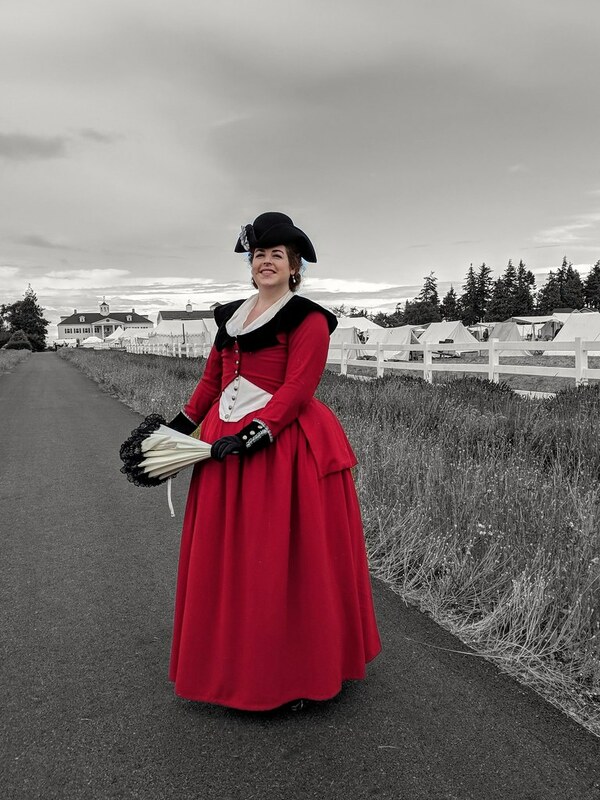 I haven't done 18th c in ages, so I was actually glad for the colder, wetter weather, because it meant I could wear my riding habit again. 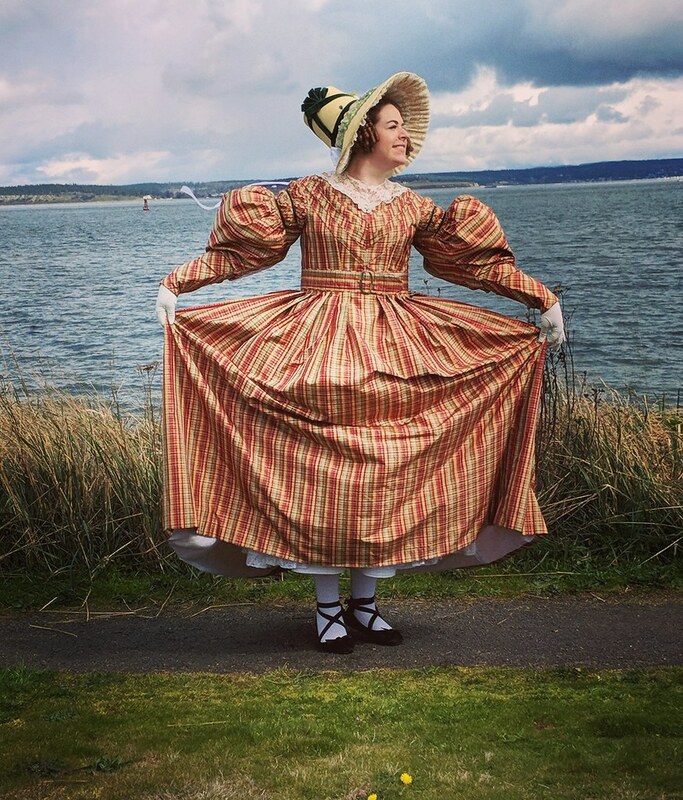 I wore it over my quilted petticoat, and I did not regret that decision. I did get warm when the sun peaked out, but it kept me so nice and dry when it was raining - none of the rain got through to me at all! 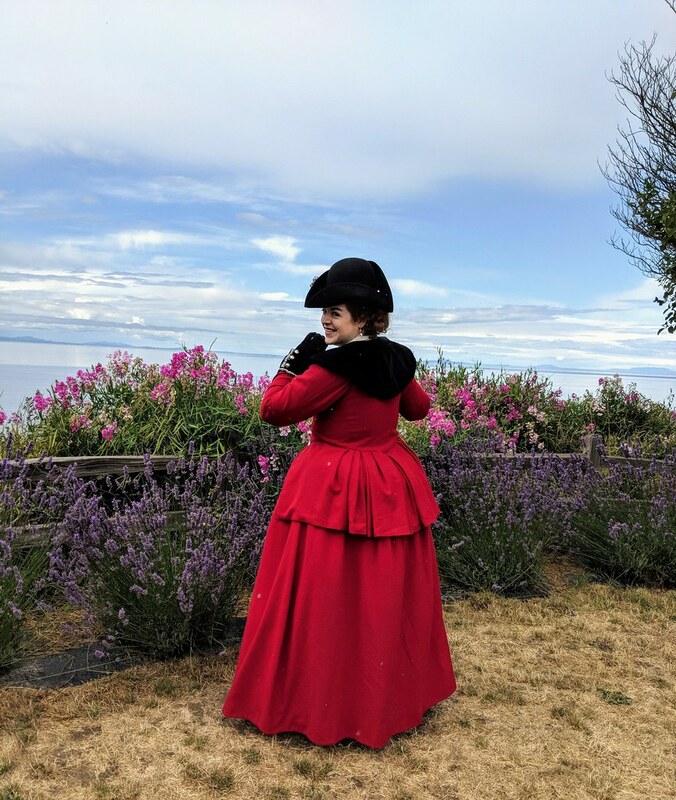 Because of the rain, I decided not to wear the velvet 1780s-style hat I made to go with it originally, and instead, decided to wire the brim of a black wool hat I had in the stash, and make a tricorn. It would have looked much better with feathers, but not in the rain, so I decorated it with a simple ribbon cockade. It's the least favorite part of my outfit, but I think it looked okay. At the event, there was a decent sized encampment (way bigger than when I was there in 2015! 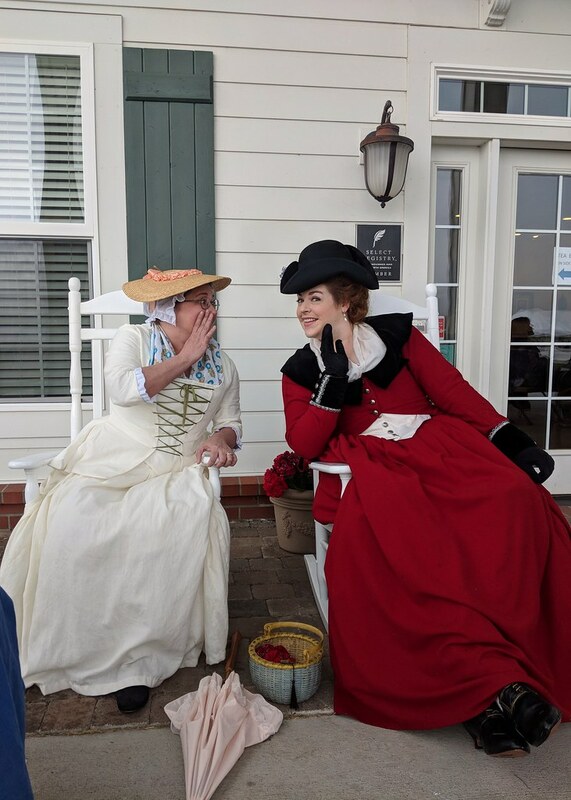 ), presentations and some items for sale from the DAR (I bought a nice cap for $15), some other presentations from reenactors, a tea on the sun porch of the inn, and a battle on the reproduction Lexington and Concord bridge. Anyway, here's what you want - pictures! I'll have the rest of the pictures up on Facebook within the next few days. Naturally, I took a ton. 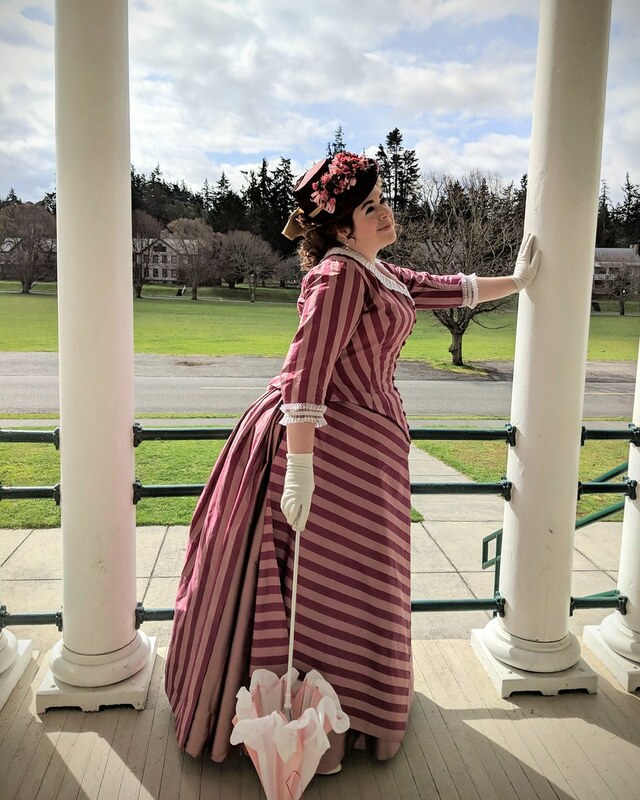 I managed to finish everything, and wore it all this last weekend at the Victorian Festival. 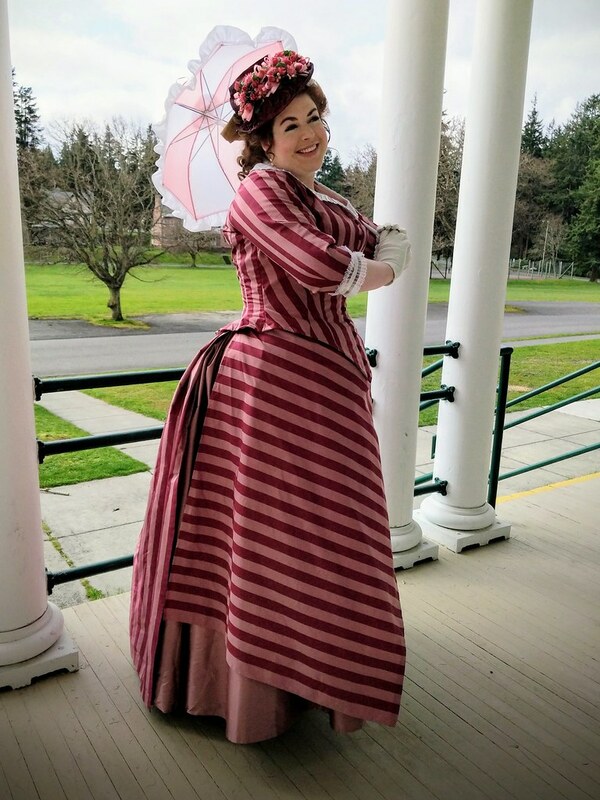 I wore my old plaid 1890s on Friday evening (no pictures of that, because I've worn it so many times), wore the 1830s during the day on Saturday, brought out last year's turquoise gala gown on Saturday night, and wore my new burgundy/mauve stripey bustle on Sunday. Unfortunately, the festival was really not great this year, but we've all kind of committed to attempting to make it better next year. If that fails, then I might not go again. 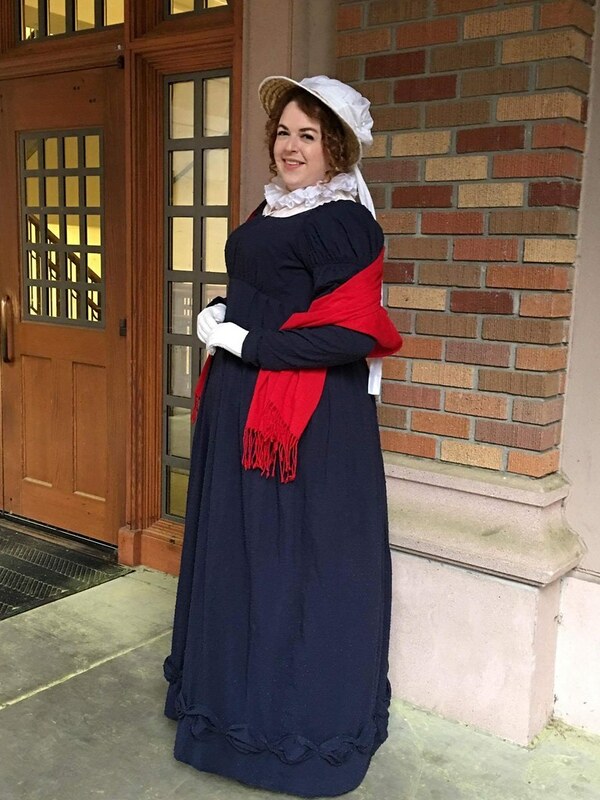 Saturday, I attended a lecture on the history of the buildings in Port Townsend, wandered around the shops for a while, went to tea, and participated in the fashion show while wearing the 1830s outfit. I actually did wind up sewing on the bit of lace around the neckline, but even better, I was loaned a lovely antique piece of lace to fill in the neckline, which went perfectly! 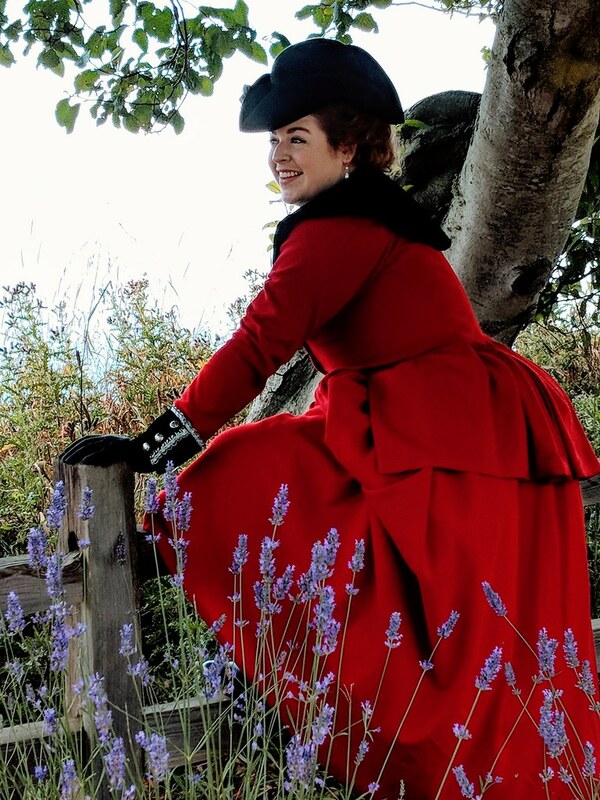 And the bonnet wound up being pretty perfect, too. Then I changed to the gala dress, went to dinner, and to the dance. 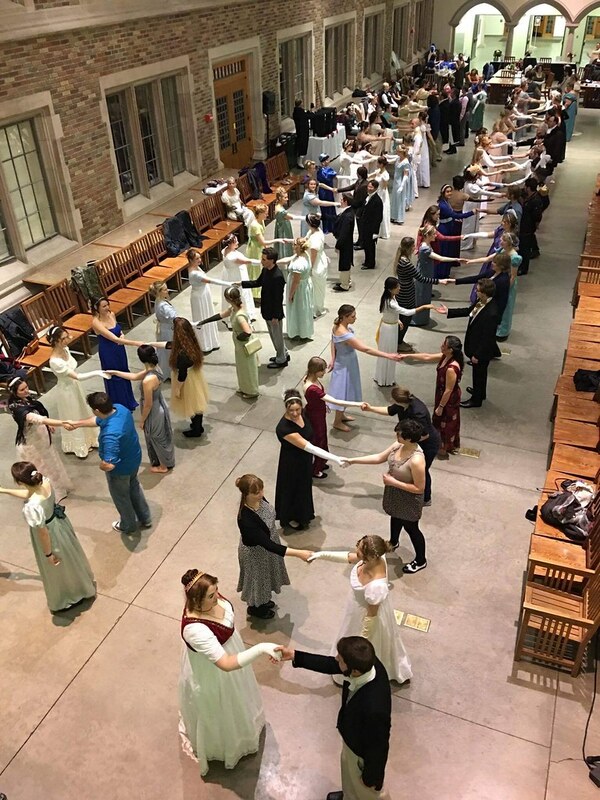 The ball sucked this year, so I literally danced half of two dances before someone ripped out 5" of hem ruffle, and then it put me in a mood. I stayed maybe 30+ mins more before calling it a night. 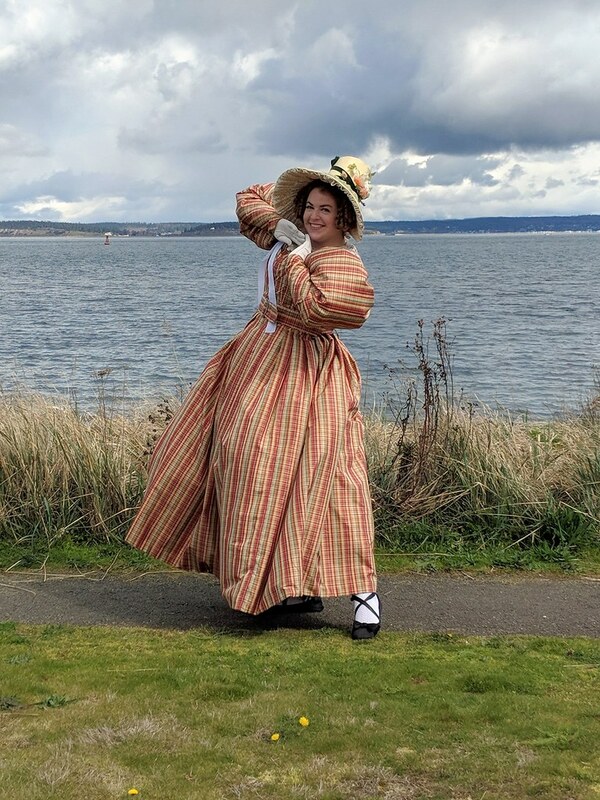 Sunday was better - I donned my new dress and we went out to Fort Worden to take pictures - it's my favorite backdrop for pictures, since it has lovely old buildings and goes out to a point with a beach on either side. We were only there for a bit, but it definitely made the weekend end on a much better note. Anyway, here's what you really want - pictures! If you would like to view the rest of my pictures, please click here. 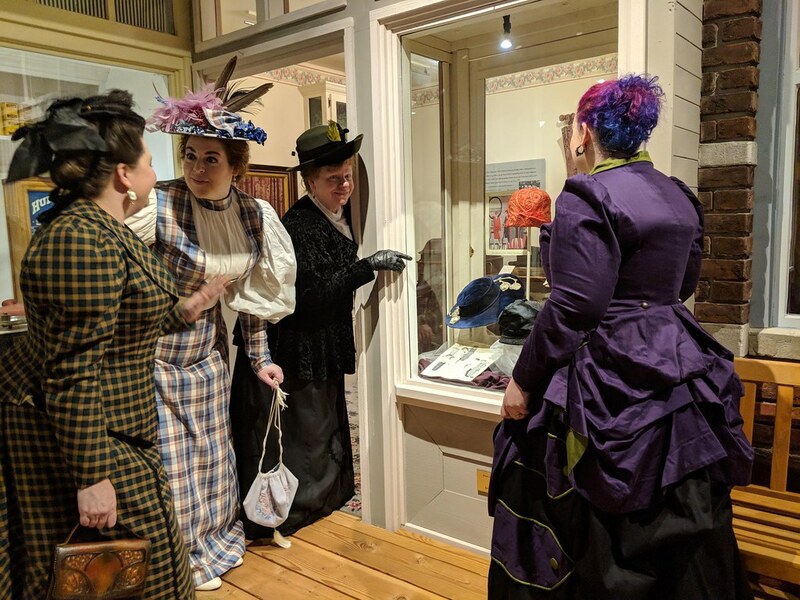 On Saturday, January 13th, a few of us from the Puget Sound Historical Costumers Guild (Agnes, Mara, DodiRose, and myself) met up to visit the corset exhibit at the White River Valley Museum in Auburn and go to tea in Sumner. 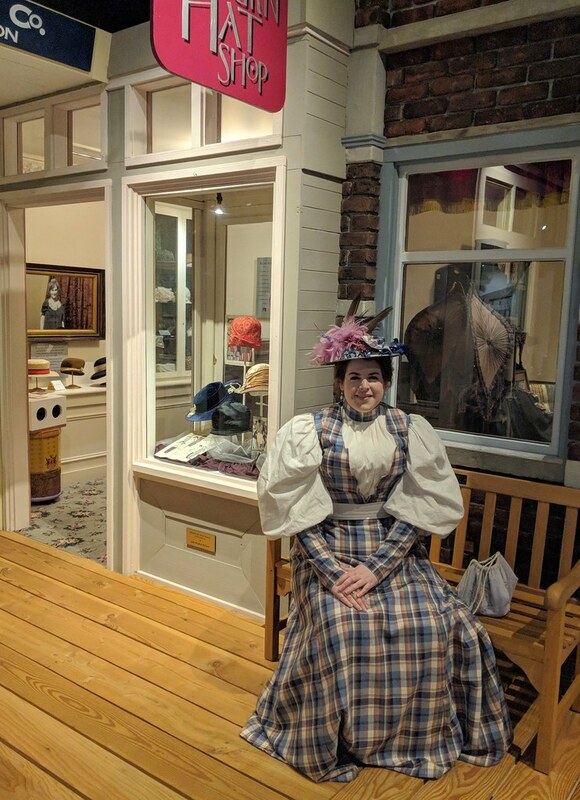 The corset exhibit was a little disappointing (mostly because I think it perpetuates a lot of the unfortunate corset myths), but we also took pictures in the area of the museum that has an old town setup. 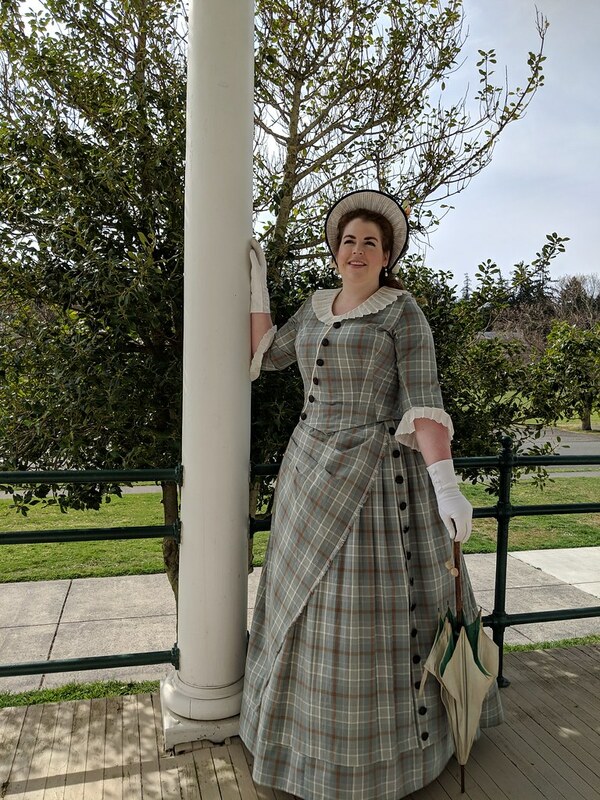 I wore my plaid 1890s dress. I should probably make another day dress of this era, since I feel like I wear this one so often. Here's a few of the pictures, and the rest can be found here. Actually, I've been doing a fair bit of sewing. I have about 2/3 of the trim on the commission at this point, and I managed to make myself a new spencer after all! Last Sunday, the night before I left on a work trip for Las Vegas, I mocked up a sleeveless spencer (based on the pattern I used for the back and under-part of my bib-front dress, with the front altered into more of a deep v). Then I cut it out of some red velvet I had laying around, and flatlined it with some leftover ivory silk. I sewed the five pieces together by machine, and sewed one side of the binding down around all the edges. Then I threw it, some trim, and my handsewing kit in my bag for Vegas. 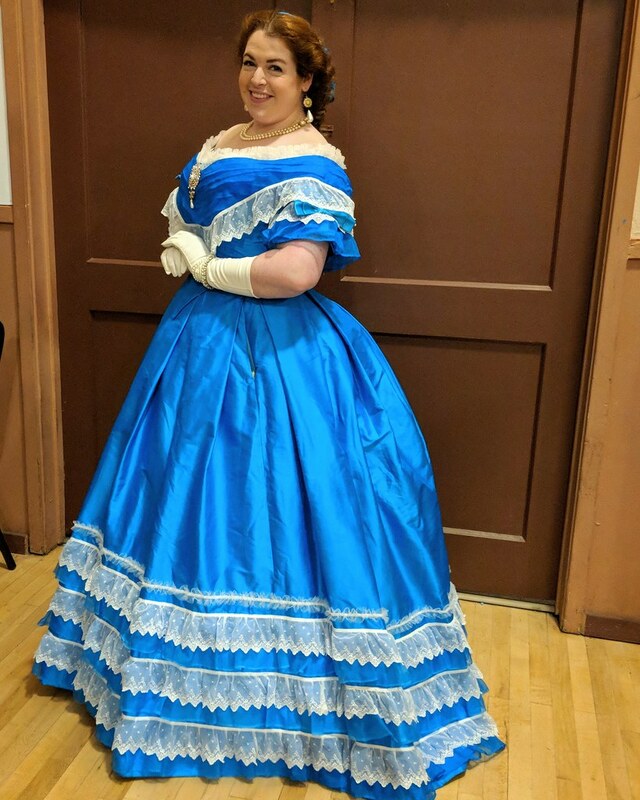 I whipped all the bias down, and added trim around the neckline, and was able to wear it Sunday night for the Regency ball! 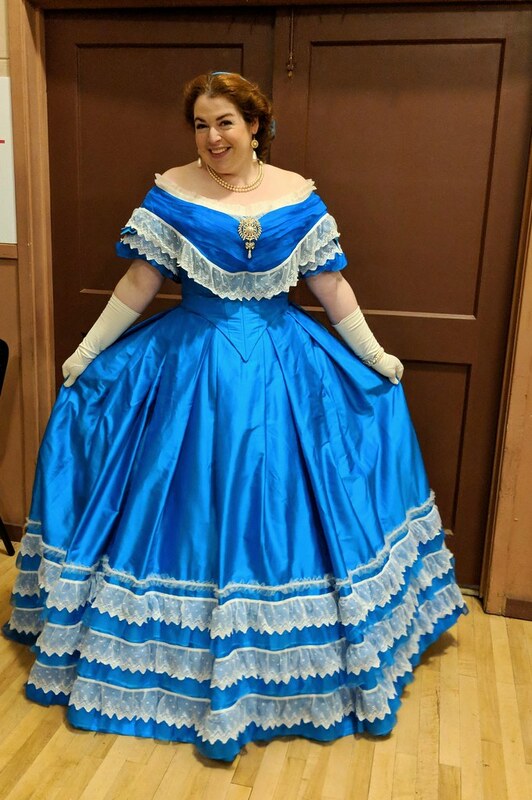 I wore the giant turquoise ballgown on Saturday night for the Victorian Festival ball in Port Townsend. Overall, it was a success, but it definitely wasn't perfect. 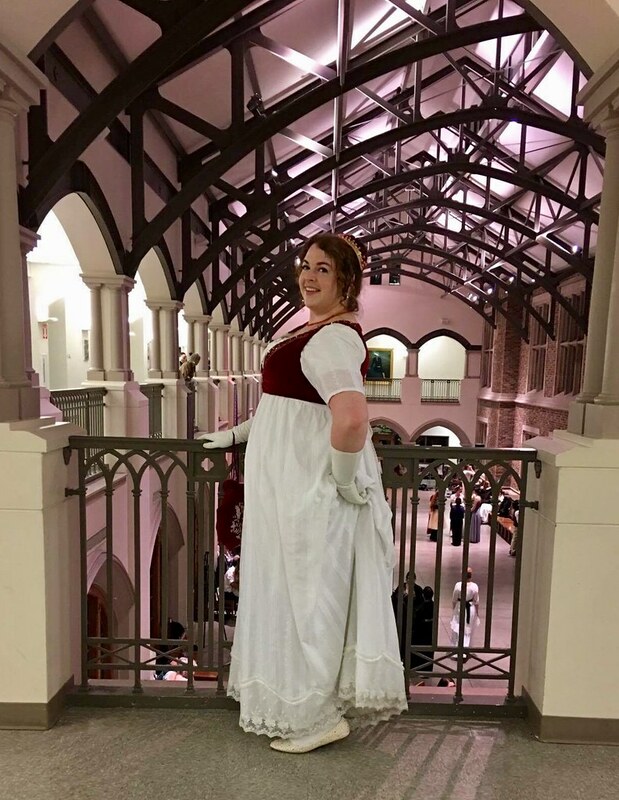 For one thing, I'm really glad I made a modesty panel - I don't know if my corset was not laced down enough or what, but I had about .5" gap in most of the lacing. And then the weirdest thing is that from the waist down, it couldn't lace closed at all. I think there was a good 2" open at the very bottom. 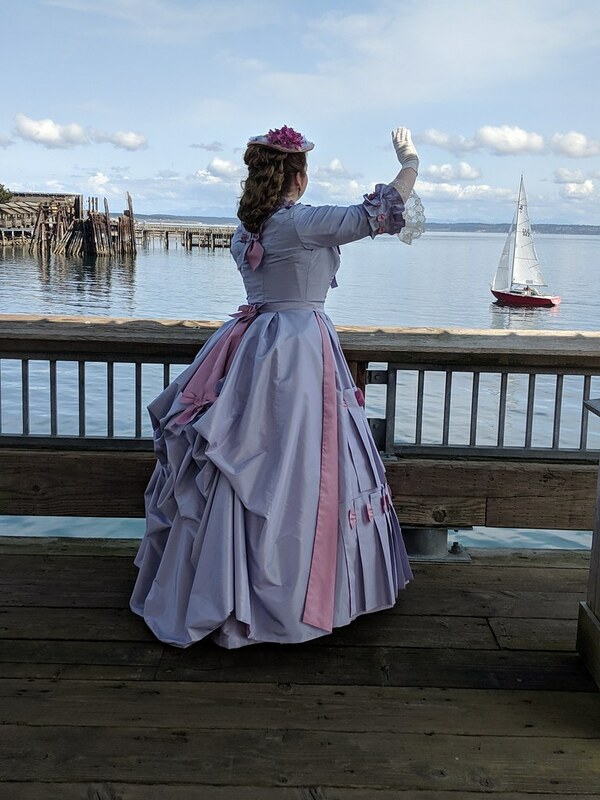 I'm not sure why that is - I took the pattern from my old ballgown, which is worn over the same cage crinoline (though I was wearing it with one less petticoat). Anyway, I don't really think there's any way to fix that, even for version 2, but if anyone has any suggestions, please send them my way! The only other weird thing was that the top of the bodice kept trying to ride down in front. 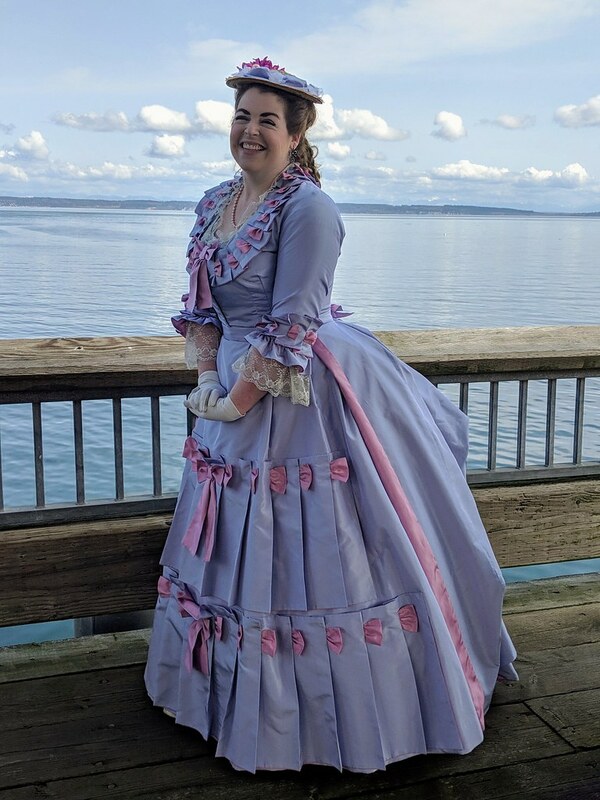 I know it wasn't the waist shifting, and I had bones in the CF that went up to the bottom of the bust, but above that, the bodice wanted to scrunch down, which showed my chemise a little on top. Again, not sure how to fix that. The scrunching will be hidden by the bertha, and I do plan to add more bones in the seam allowances, but I don't think that will solve it riding down. Other than that, though, I loved it. It was very comfortable, and despite the small sweep in back, it was just fine to dance in. I'm excited to see what all version 2 will hold, though I'm probably going to take a small break, and make Designer Disney Snow White before I go back to it. I'm attempting to post from my phone, so I'm not sure if this will work. I'll do a full wrap-up when I get home. I did finish the skating dress about 1:30am on Thurs morning, packed after work, dyed my hair after rehearsal, and sewed the 17 buttons on my quilted petticoat at the airport. I managed to sleep a couple hours on the plane, and a couple more once I got to Elizabeth's house, so I wasn't completely dead yesterday. We went out to lunch, and then to the Hill House, and took lots of pictures. Here's a couple for now - the rest are on my Facebook. It's so fun so far, but I wish you all were here, too! The event today was lovely. There wound up being seven of us in total, which is a great turnout for an event planned one week prior! We all walked around the fort for a while, looking in all the buildings and exhibits. Two of the buildings date to the 1850s - I think one of them is supposed to be the oldest wooden structure in WA. We took some nice group shots, and then we headed right outside the fort to a picnic area, and had a lovely lunch! I also started row two tonight on my skirt. I'm about 1/4 of the way done with it at this point. It's going a little slower than I hoped it would - I was really aiming for 1/3 done, but I absolutely love how it's looking. I finished the first row!!! Anyway, we went to see Love and Friendship yesterday, and it was mostly wonderful. The men's costumes were pretty darn perfect (and omg at one point I was so distracted by how freaking amazing the portrait buttons on his jacket were that I don't think I paid attention to that scene). The women's costumes were mostly good, with the exception of most of Chloe Sevigny's (weird home dec size stripes, and oddly cut bodices), and Kate Bekinsale's. Hers were the real problem. They started out pretty good, but got worse and worse as the movie progressed. I also think she stopped wearing stays partway through, because they started fitting her very weirdly. 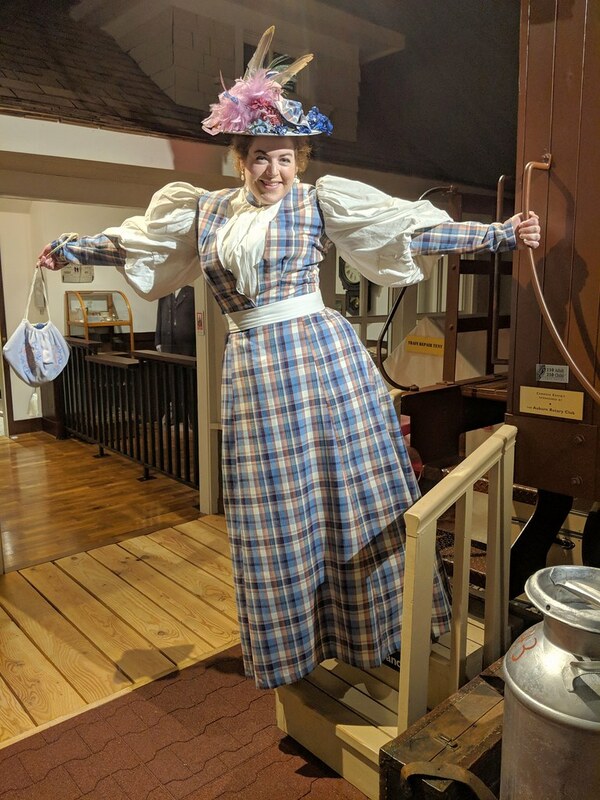 But they also started to totally lose era-appropriate fabrics (like one dress with a tulle overlay), and era-appropriate shapes (one looked like a bad Simplicity Victorian bodice). On the other hand, most of the outfits the more minor characters were wearing were lovely! There were a few weird issues that someone should have caught, though. In the opening sequence, they do a closeup of each person, with their character name and a brief description. On one lady, her shoulder was worn to the point of being threadbare. 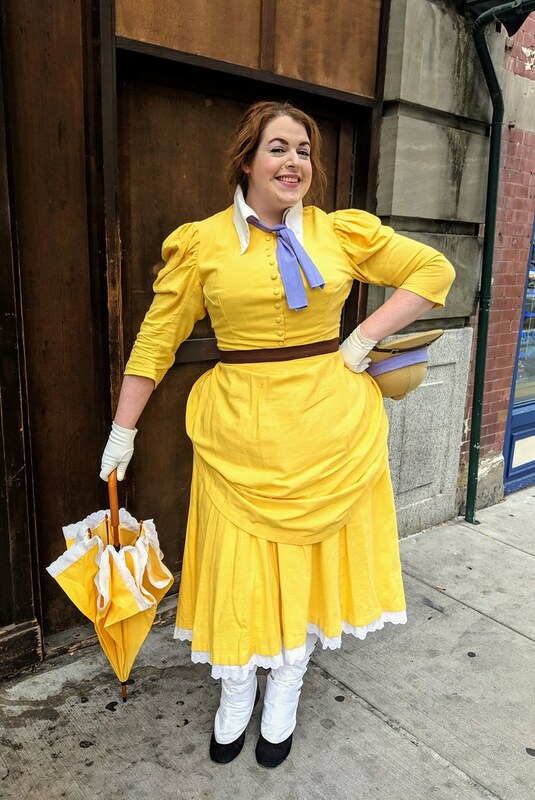 Later in the film, Chloe Sevigny is walking outside, wearing a petticoat with a ruffle at the hem, but the ruffle had torn off the hem for at least 1.5" along the front of the skirt. And then as Reginald DeCourcy is standing in the doorway of his bedroom partway through the movie, there is what looked like an Ackerman's Regency fashion plate from what looked like the 1810s behind him on the wall. Whoops! But overall, it was very funny, most of the costumes were great, and I highly recommend it! I had so much fun this weekend at my Harry Potter marathon. I had one friend stick it out with me the entire time, which was awesome, and three others (inlcuding vanessa_lynne) came for some but not all of the movies. We started about 9:30am yesterday, went to around midnight, and then started again around 11:30ish today and finished around 3pm. 19.5 hours of Harry Potter total! We crafted during the first few movies, making a Ravenclaw banner, chocolate frog boxes (my friend made chocolate frogs that we stuck in the boxes! ), and Bertie Botts boxes (which we filled with regular jelly beans). We also built a lego fortress. And we had a ton of awesome food, inlcuding butterbeer cupcakes, regular butterbeer, alcoholic butterbeer, and tea, of course. :) I also made Ryder a 3 minute Dobby costume, which was adorable! We brought out the diadem for Deathly Hallows, and Ryder wore his costume both days. His costume didn't phase him at all. And Laura and I both wore Ravenclaw uniforms on day 1. On day 2, I wore my new HP skirt. My friend Laura, and her awesome chocolate frogs! And then tonight I dyed my hair for the show (it's so dark brown it's almost black, which is both exciting and scary), and I'm about to go finish the last 20-30 mins of sewing on Princess Sofia. 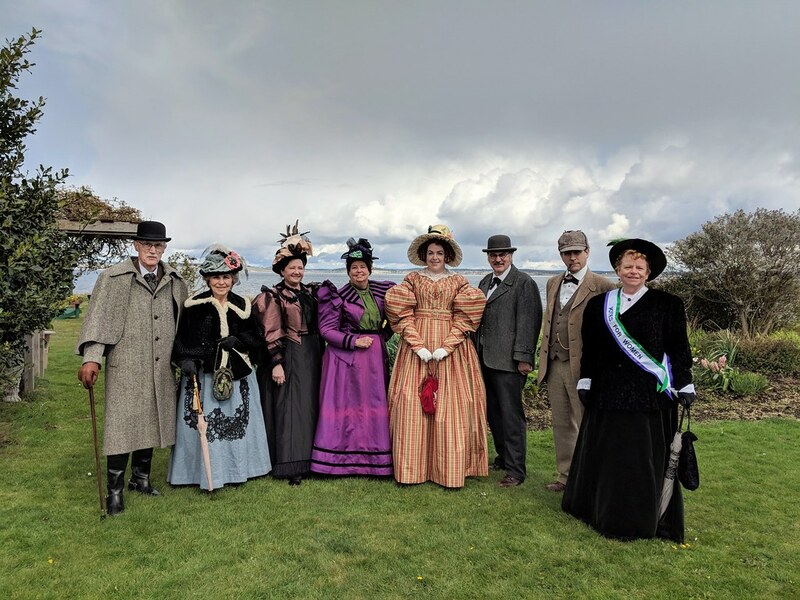 My bf and I had a lovely pre-birthday weekend at the Victorian Festival in Port Townsend this year! 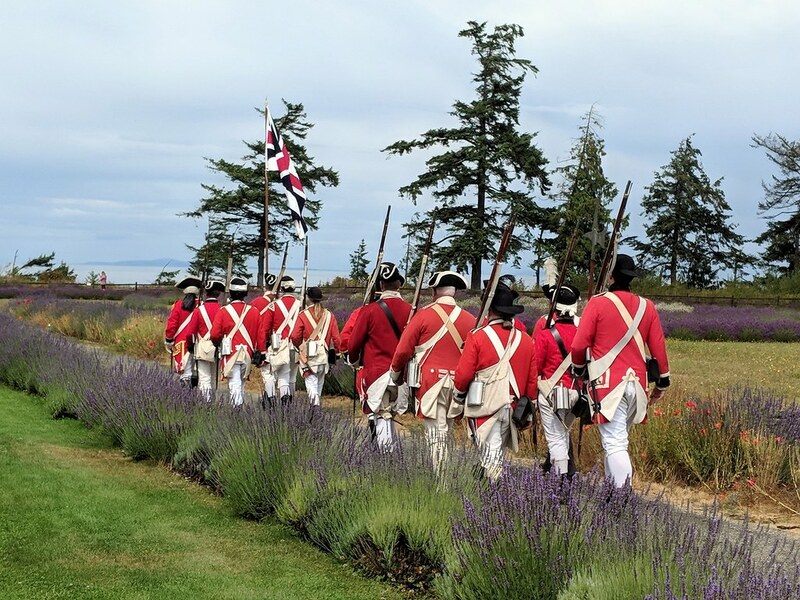 We drove out Friday, and arrived around 4pm, changed, and headed out to Fort Worden. 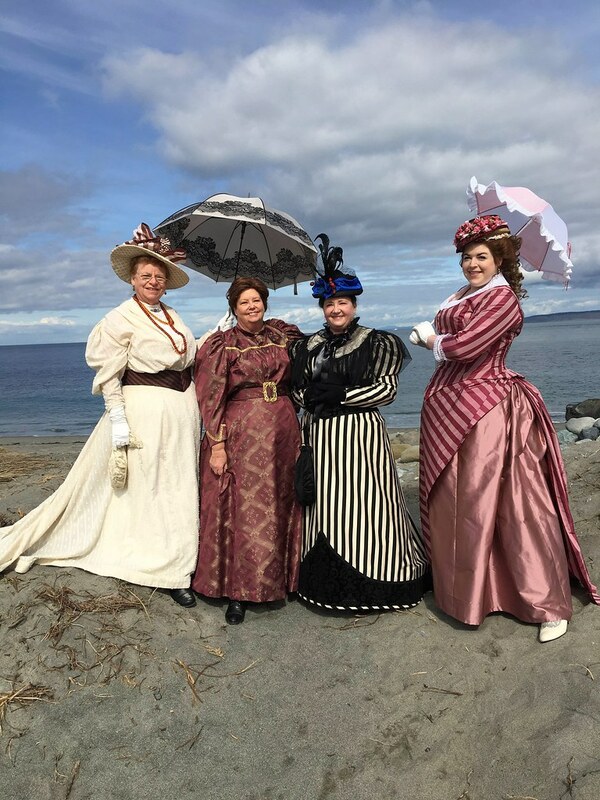 We had so much fun at the fort last year that we definitely wanted to enjoy the beautiful beach again. 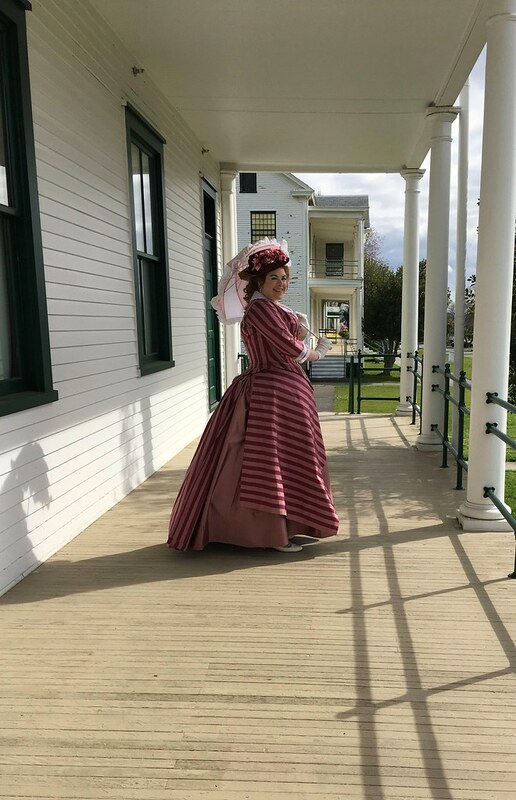 I wore my new sheer dress, and he wore his new Civil War Signal Corps uniform. 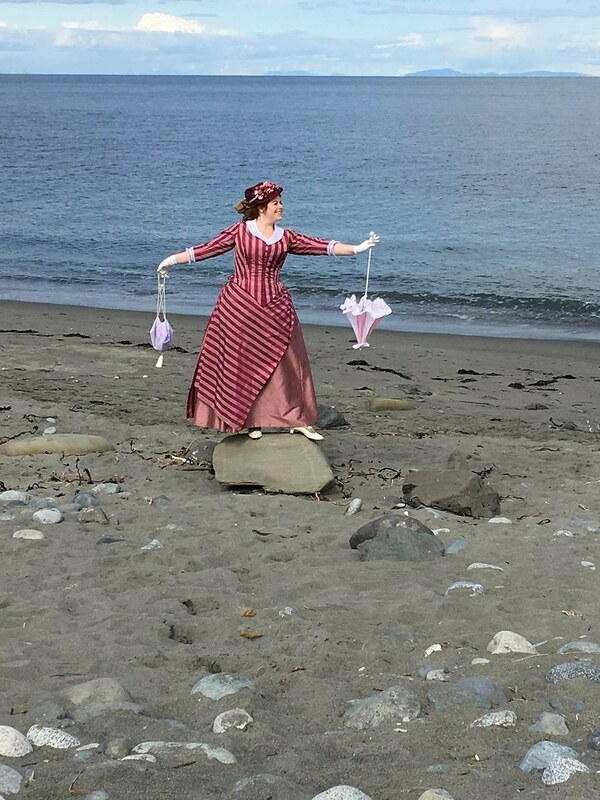 We played around at the beach for a while, taking lots of pictures of each other, and then headed back into town for the end of the shanty singalong. 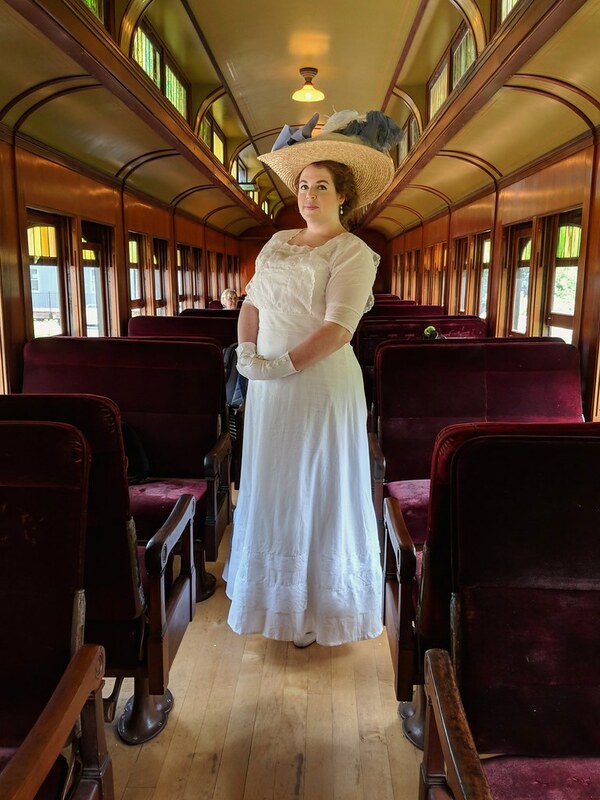 On Saturday, I wore my cream and green bustle gown. I did a little browsing, then Sean and I attended Val's lecture on how to wear watches, which was super informative! I'm glad I caught it here, since I missed it at CoCo last year. I attended another lecture, too, then met up with DodiRose, and we did a little shopping before I headed back to grab my things for the fashion show. It was pretty fun being in the show this year, mostly because I got to hang out backstage and chat with friends most of the time. 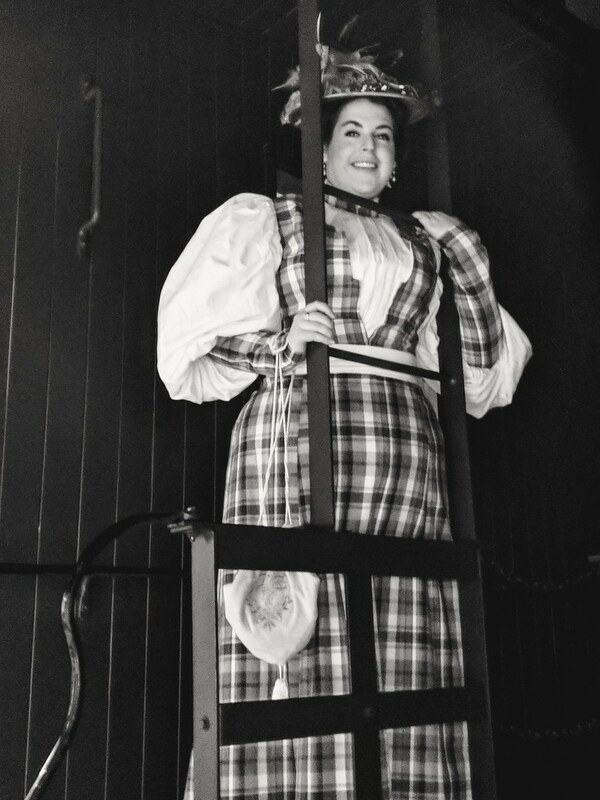 I wore the green and cream, then changed into my new black bustle gown for the second half. Afterwards, we joined up with DodiRose again, and she and Sean and I all went out to dinner before heading to the ball. The ball was so much fun this year! Good dancing, and again, lots of time to socialize. I think we were the last table to head out at the end of the night. 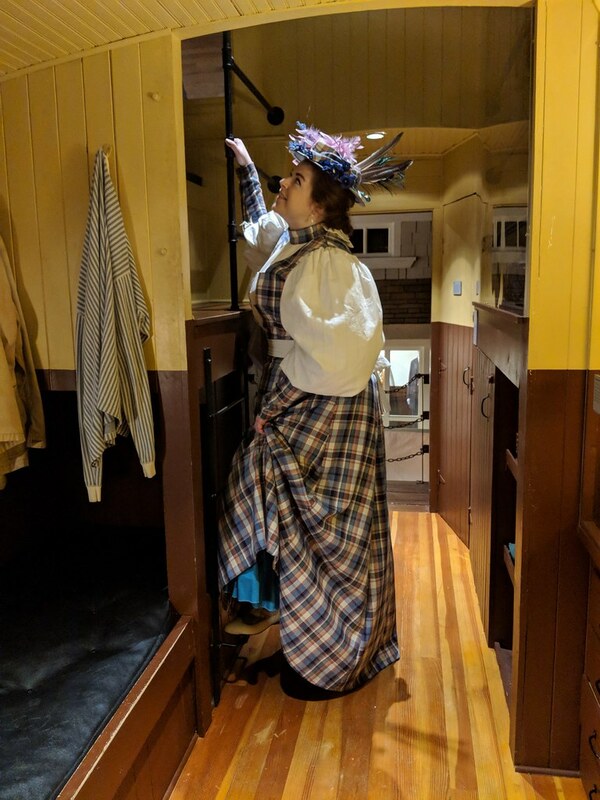 Today, I wore the plaid 1890s dress, though by the end of the day, I had had to remove all three of my taller feathers because of the wind! We did a little more shopping with vanessa_lynne and her fiance earlier in the day, then many of us went out to tea at the Commander's Beach House. It was a lovely time, and I really hope this event continues next year! 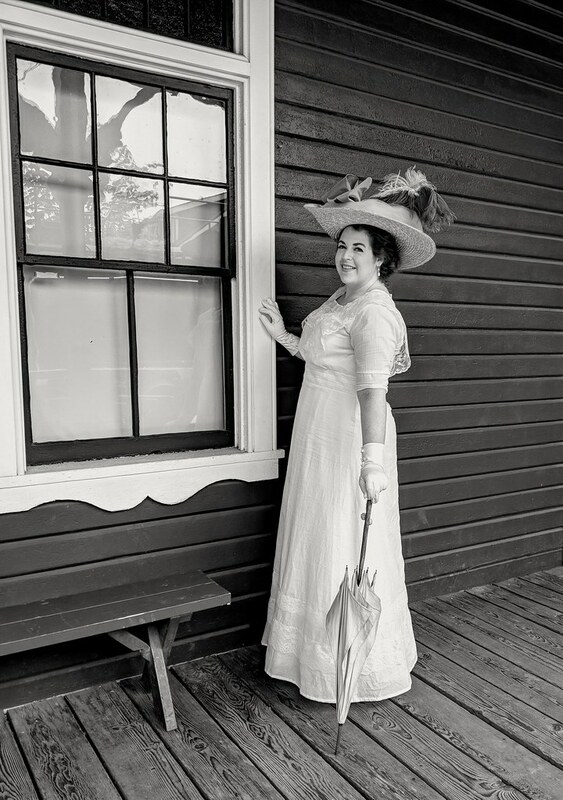 My Titanic/Downton Abbey dress was finished in plenty of time. Okay, maybe not plenty, but I finished it last night without stressing or staying up too late. So I call that a win. I also lucked out, and was able to have help doing up the 5 or 6 h&e that I couldn't reach in the back. 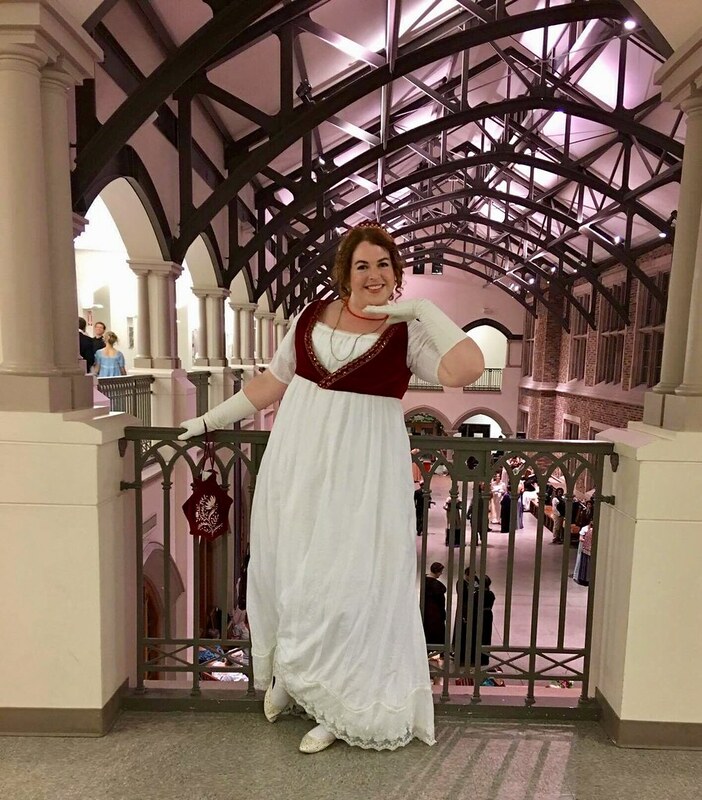 That said, unfortunately, all the hooks with thread bars on the chiffon part of my bodice wound up coming undone by the end of the event, when we were taking all the pictures. Oh well. Luckily, my phone takes such blurry pictures that you can hardly tell in the photos! 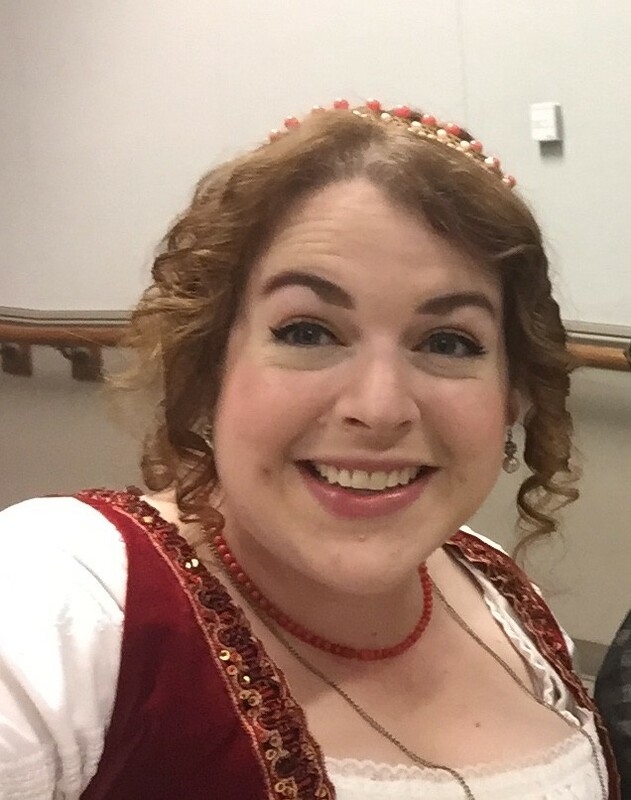 It was fun getting to wear so much sparkly jewelry, and I liked the fit of the bodice enough that I decided not to wear the sash with it. I'm waiting for the official event photos from KCTS9, in the hopes that I'll get some better ones, but here's a few that we took with my phone tonight. I was pretty proud of how huge I got my hair, though it definitely got messier as the night progressed. They also gave us a goodie bag afterwards, with all this stuff, plus they gave out books called the Wit and Witticism of Downton Abbey. 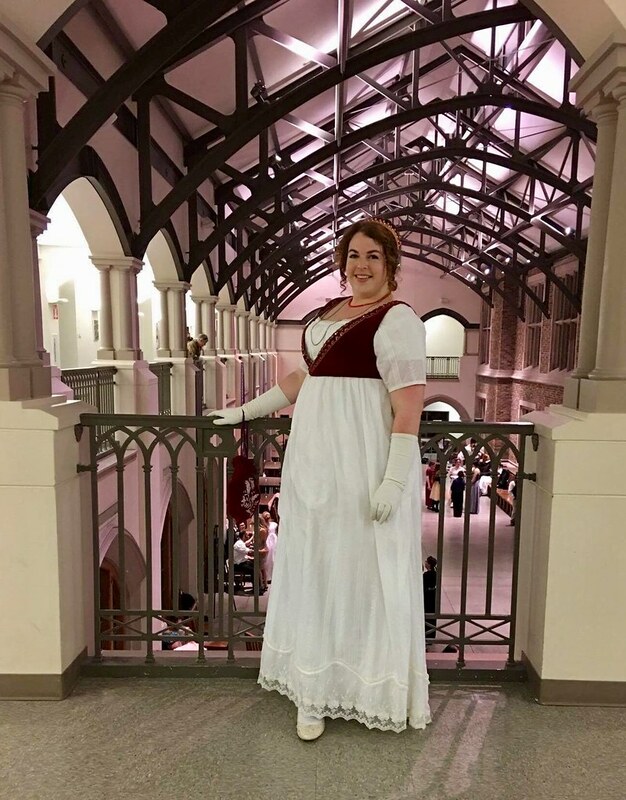 On Saturday, my bf and I went to Steamposium, and it was pretty fun. It was in the waterfront convention center, so the location was good, and they had great vendors, many of whom were even very reasonably priced! 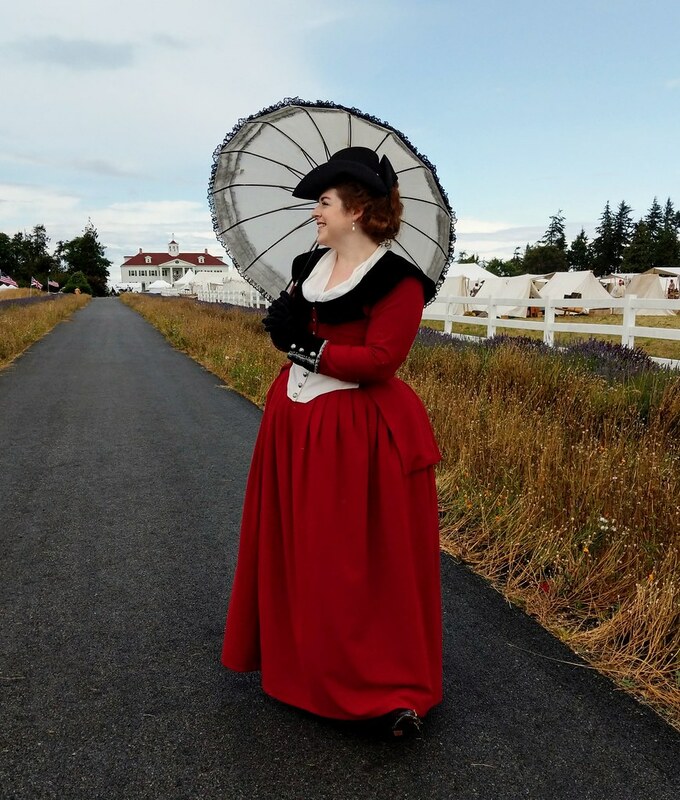 I attended three lectures - one was a vocal workshop, which was kind of neat, one was a panel with four contestants and one judge from Steampunk'd (very cool, because they told quite a bit of behind-the-scenes of what goes on in making a show like that), and one was a terribly innacurate lecture on corsets. (I kept wanting to correct her. Eventually I just left). The ball was a big dissapointment - nothing like the elegant balls they had at Steamcon when that was still going on. But my bf and I did a little swing-dancing to the few songs that were actually danceable. Then we left. There were also some really cool gadgets there though! Definitely the highlight were the two working robots - one, a dalek, which was actually made by a friend of mine, though this was the first time I've seen it. It was so cool! It lit up, and she could talk through it with a voice changer, and it wheeled around and blew steam and stuff. And the other was a Steampunk R2, whose barrel body was actually a working beer tap! Somehow, Sean and I didn't get any pictures of each other during the day (I wore my green and cream bustle), and we have one selfie of us with a friend. 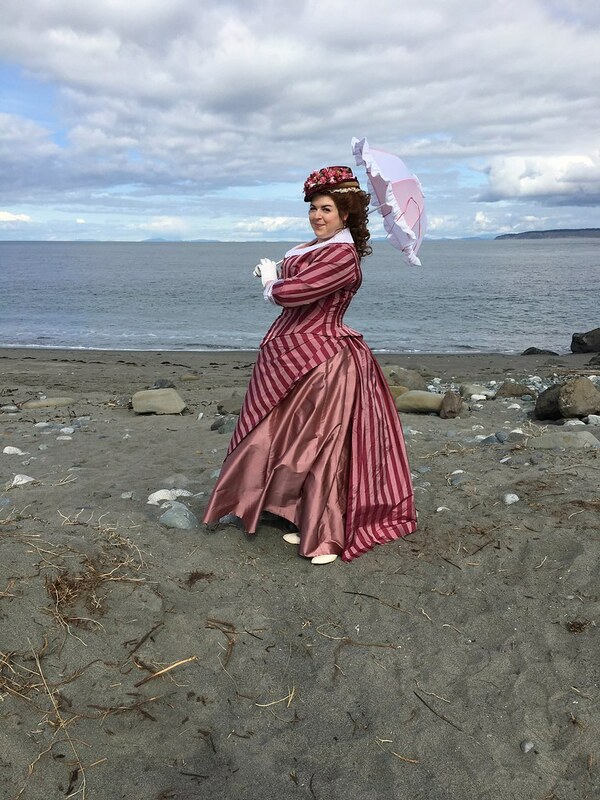 But he did take pictures of me in my new ballgown bodice! The neckline turned out kind of gappy, and I'm not sure how, so that was slightly disappointing, but I'm still quite pleased with the rest of the bodice, even though I didn't have time to sew in any of the boning except the very CF. Oh, and I bought a thing. One of those reasonably priced vendors had so much cute stuff! It was between this one, or a watch whose top had been taken off and had Toothless on it instead. Here's a link to her store if anyone is interested. It doesn't look like there's really anything in there right now, but she does take custom orders. Sorry, I don't know why these pictures are going in upside-down.